CHONGQING, May 17 China on Thursday morning launched a rocket developed by a Chinese private company from a launch center in northwest China. "Chongqing Liangjiang Star," launched at 7:33 a.m., was developed by OneSpace, a Beijing-based private company with a manufacturing base in southwest China's Chongqing Municipality. "This is the first commercial rocket developed by our company," said Shu Chang, founder and CEO of OneSpace. The nine-meter-long, 7,200-kg rocket has a maximum altitude of 38.74 kilometers and a top speed of more than 5.7 times the speed of sound. It can travel for around five minutes, or 273 kilometers, according to Shu. Chinese company OneSpace has successfully launched its first single-stage OS-X solid rocket to an altitude of around 40 km, marking a significant moment for the nascent commercial launch sector in China. Liftoff of the rocket, named 'Chongqing Liangjiang Star', took place at 07:33 Beijing time at an undisclosed site in northwest China. According to reports, the rocket flew for 265 seconds, reaching an altitude of around 40 kilometres and surpassing Mach 5, travelling some 273 km, with the rocket then falling to Earth within a designated zone. OneSpace Technology was established in 2015 and has quickly developed its own launch capabilities, which its suborbital flights part of a research contract with an aerospace company for aerodynamic and other high-altitude tests. The company is aiming to provide launches for prices lower than US$10,000 per kilogram, claiming to save mass and fuel requirements with lighter electronics and other innovations. The OS-X has a mass of 7,200 kg and uses a solid engine with a thrust of 350 kilonewtons (kN). The company hopes to test launch an orbital rocket, the OS-M1, around the end of the year. The name of the first rocket - Chongqing Liangjiang Star - taken from the company's manufacturing base in the Chongqing Liangjiang New Area, an economic zone named for where the two rivers, Yangtze and Jialing, meet. The event has drawn comparisons in both Chinese and Western media between OneSpace and the early days of SpaceX, a US startup founded in 2002 that has revolutionised the launch industry with low costs, iterative design processes, pioneering vertical takeoff, vertical landing (VTVL) capabilities and subsequent first-stage reusability with its Falcon 9 orbital launch vehicle. OneSpace is, however, looking to a different market, with low-cost launches of much smaller payloads than those carried by the Falcon 9. And while the company is planning orbital launches with an OS-M series rocket, and eventual reusability of its rockets, it faces a series of competitors domestically. 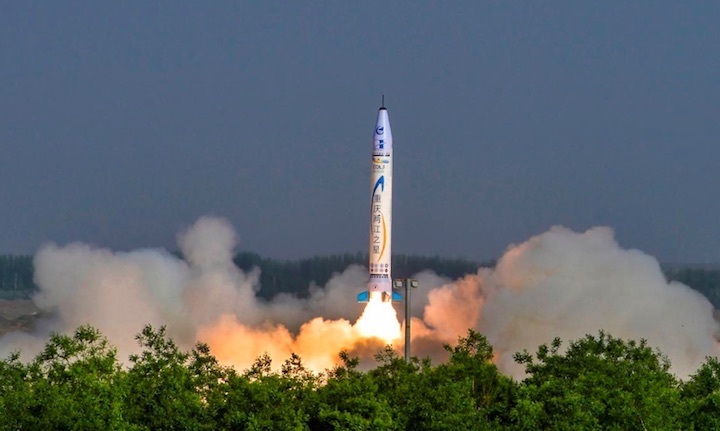 Chinese private space company Linkspace has taken a step in its development of a reusable orbital rocket with a successful vertical takeoff, vertical landing test. China opened its space sector to private capital around 2015 and encouraged technology sharing through a civil-military integration reform policy, and the impacts are now becoming apparent. OneSpace itself has received support from the State Administration for Science, Technology and Industry for National Defence (SASTIND), and has raised 500 million yuan (US$77.6m) through finance rounds, according to Tencent Technology. Last month another space launch provider named i-Space launched its own solid rocket to an altitude of 108 km, above the Kármán line, one definition of the boundary between Earth's atmosphere and outer space. Other emerging players in the Chinese commercial launch sector include Landspace, using technology from the Long March 11 for solid rockets while also working on a metholox engine. 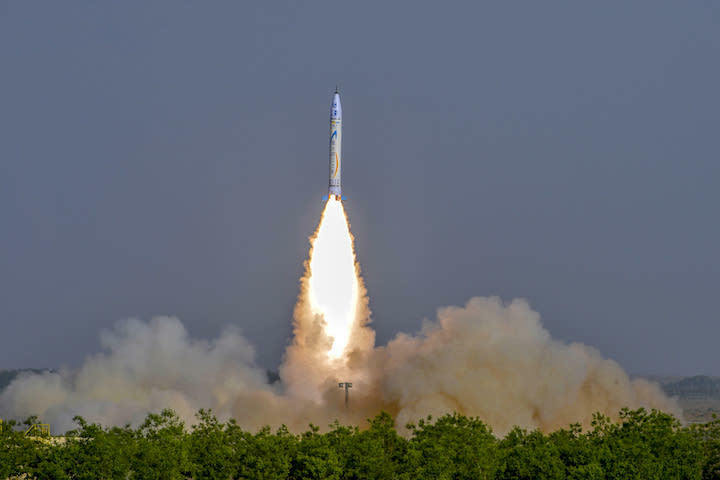 Linkspace, based in Beijing, has recently succeeded with a vertical takeoff, vertical landing (VTVL) test, and Expace - linked to state missile-maker CASIC - is aiming to perform four commercial launches inside a week later this year. Finding a path to producing or becoming a disruptive launch service provider with capabilities and visions approaching that of SpaceX however appears to be a monumental task. CHONGQING -- The Chinese startup that launched the nation's first commercial rocket on Thursday aims to be a major global player in the space launch business. Beijing-based OneSpace, led by 32-year-old CEO Shu Chang, sent up the OS-X Chongqing Liangjiang Star from a site in Inner Mongolia at 7:33 a.m. The 9-meter-long, 7.2-ton rocket traveled a total of 273km during the five-minute flight, soaring as high as 38.7km. "I hope we can become one of the world's foremost small-satellite launchers," Shu told reporters. OneSpace enjoys a notable cost advantage. A rocket launch comes in under $5 million -- less than one-third the international average. The entrepreneur, who founded OneSpace in 2015, is often referred to as the Chinese Elon Musk, after the Tesla chief who founded SpaceX in the U.S.
Shu studied design at Beihang University, formerly the Beijing University of Aeronautics and Astronautics, and earned a finance-related master's degree from Peking University. He worked at an investment fund under the state-owned China Aerospace Science and Technology and investment company Legend Holdings, which has a stake in Lenovo Group. OneSpace has raised 500 million yuan ($78 million) from parties including a Legend Holdings fund so far. It has formed a joint venture with the Chongqing municipal government, with the company owning 50.1% and the local government the rest. The venture will open a production base in Chongqing by year-end. The space launch business is energized with startups. U.S. company Rocket Lab launched a second small rocket in January. SpaceX sent up the world's most powerful rocket this year and is trying to disrupt pricing in the industry. Amazon.com founder Jeff Bezos, often seen as a rival to Musk, has founded space startup Blue Origin. OneSpace aims to challenge these American competitors. Some in the West doubt whether OneSpace is truly a private company, given its government ties. It has received aid from military-linked businesses and financial backing from a local government. OneSpace may come under pressure to improve transparency.